Chonda Pierce has shared her unique brand of humor with over 1,000,000 people this past year. In the course of an hour she has audiences laughing, crying and closer to understanding the grace God extends to us in the midst of trial.Through her tongue and cheek delivery Chonda lovingly pokes fun at life's daily challenges as only she can. From conversations between a husband and wife to Charlie's Angel....yes Charlie's Angels, Chonda explores life's experiences and how they make us who we are.Music has always played a vital part in Chonda's live performance and now she invites you to experience her first full-length vocal project. Chonda had the opportunity to work with producer Mark Bright (Diamond Rio, Trisha Yearwood and Peter Cetera) on songs that were seemingly created just for her. From the up tempo Whenever I Think of You to the moving anthem God loves You, Chonda shares her heart and relationship with a loving Heavenly Father. 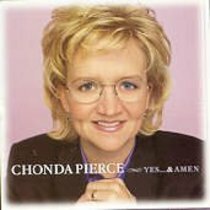 Chonda Pierce is a speaker, comedian, author, singer, preacher's daughter, wife, and mother of two. She is author of It's Always Darkest Before the Fun Comes Up and I Can See Myself in His Eyeballs, and she has performed on more than a dozen recordings. Chonda lives in Murfreesboro, Tennessee with her husband and two children. Visit her website at www.chonda.org.